Great looking bottle! Love that lime green color. 1876 would make that bottle a product of S.F.& P.G.W. Pacific Glass Works having recently been shutdown and the property put up for auction and sold in May 1876. The first advertised listing for S.F. & P.G.W. appeared in April 1876. Just think, this bottle was made at the King Street, foot of Fourth Street location San Francisco, 138 years ago. Thanks for the information on the manufacture of the bottle. It amazes me how much research you have done on the western glass houses and how much of that info you can retain. 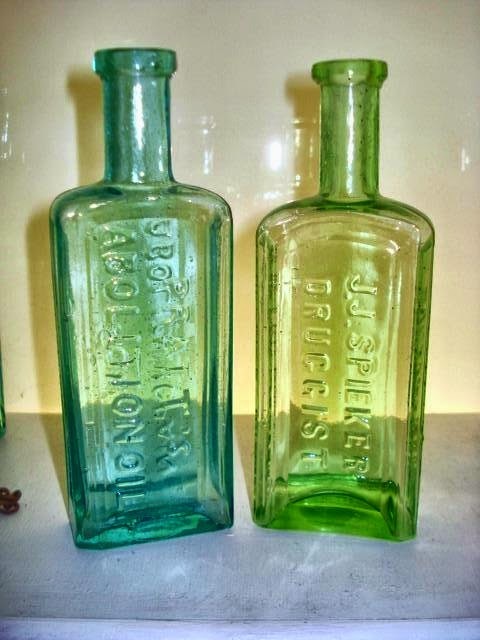 Nice early Druggist Bottle with historical significance. Especially connection with Tito M. Lash-Sacramento, Ca.